Bent Larsen (born March 4 1935) is a Danish chess player. He lives in Argentina. 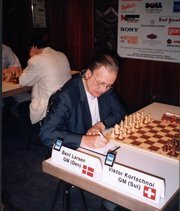 Larsen is considered to be the strongest chess player ever born in Denmark. He has won the Interzonal tournament on 3 occasions (1964 at Amsterdam, 1967 at Sousse in Tunisia, and 1976 at Biel in Switzerland). He became an International Master at the age of 19 in 1954 and two years later gained the rank of International Grandmaster. In 1988 he lost a game to Deep Thought in the Software Toolworks Championship, becoming the highest FIDE ranked player (at 2560) and the first Grand Master to be defeated by a computer in tournament play. Larsen has continued to play occasionally in tournaments to the present day. In 1999 he finished 7th of 10 in the Danish Championship, and he was 4th in the 2002 Najdorf Memorial knock-out in Buenos Aires. His Elo rating in the January 2004 FIDE list was 2461. Larsen was an imaginative player, more willing to try unorthodox ideas than most other top players; and is noted for occasionally employing unusual openings. He is one of the very few modern grandmasters to have employed Bird�s Opening (1. f4) with any regularity, and the opening move 1. b3 is sometimes called the Nimzo-Larsen Attack in his (and Aron Nimzowitsch�s) honour. This article is based on the article Bent Larsen from the free encyclopaedia Wikipedia and stands under the GNU-Licence for free documentation. In the Wikipedia a list of the authors is available.